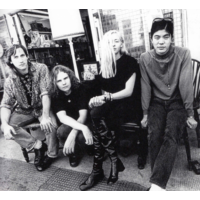 The Smashing Pumpkins is an American band that formed in Chicago, Illinois in 1988. Formed by Billy Corgan (vocals, guitar) and James Iha (guitar, backing vocals), the band has included Jimmy Chamberlin (drums, percussion), D'arcy Wretzky (bass guitar, backing vocals), Melissa Auf der Maur (bass guitar), however currently includes Jeff Schroeder (guitar), Mike Byrne (drums, backing vocals), and Nicole Fiorentino (bass guitar, backing vocals) amongst its membership. Less overtly sharing the punk rock roots of many of their alt-rock contemporaries, the Pumpkins have a diverse, densely layered, and guitar-heavy sound, containing elements of gothic rock, new wave, heavy metal, grunge, dream pop, psychedelic rock, arena rock, shoegazer-style production and, in later recordings, electronica. Frontman Billy Corgan is the group's primary songwriter—his grand musical ambitions and cathartic lyrics have shaped the band's albums and songs, which have been described as "anguished, bruised reports from Billy Corgan's nightmare-land". The Smashing Pumpkins broke into the musical mainstream with their second album, Siamese Dream (1993). The group built its audience with extensive touring and their follow-up, the double album Mellon Collie and the Infinite Sadness (1995), debuted at number one on the Billboard 200 album chart. With 18.75 million albums sold in the United States alone, The Smashing Pumpkins were one of the most commercially successful and critically acclaimed bands of the 1990s. However, internal fighting, drug use, and diminishing record sales led to a 2000 break-up. In 2006, Billy Corgan and Jimmy Chamberlin reconvened to record a new Smashing Pumpkins album, Zeitgeist. The band toured with a lineup of between five and nine musicians through much of 2007 and 2008. Chamberlin left the band in 2009 and was replaced by Mike Byrne. Corgan, Byrne, returning guitarist Jeff Schroeder, and newest addition Nicole Fiorentino are currently recording the 44-song Teargarden by Kaleidyscope, which has been released, a song at a time, since late 2009.